UPDATE: Thanks to information provided by Jason Schooley (Paddlefish Biologist at the Oklahoma Dept. of Wildlife Conservation Paddlefish Research Center) and Ben Neely (Kansas Department of Wildlife, Parks, and Tourism, and see the two articles I’ve added to the sources list at the end of this post), I have updated the map to include more of Kansas, Oklahoma and Missouri in the Paddlefish’s range. Note: As noted in the key below the map, PA and NY have paddlefish populations. They are shown in the extirpated color because the species is still officially considered extirpated by both states. When that changes, so will the map. Corrections welcome, but only if they come with reference to sources so I can verify and keep track. 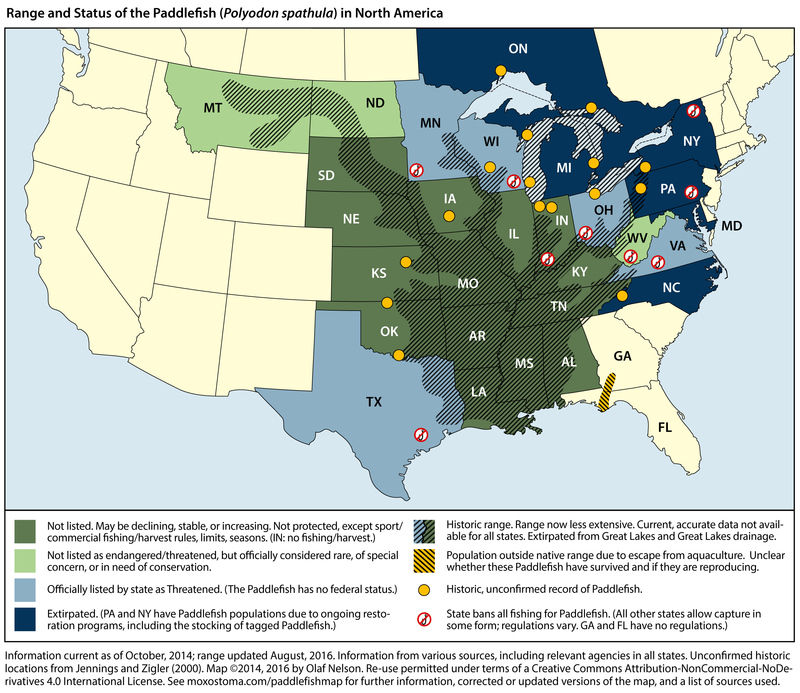 Status and distribution of the Paddlefish (Polyodon spathula) in North America by Olaf Nelson is licensed under a Creative Commons Attribution-NonCommercial-NoDerivatives 4.0 International License. (This means you may use the map for non-commercial purposes only, provided it is not altered in any way and you credit me. A link to http://moxostoma.com/paddlefishmap would also be nice. If, for some reason, you want to use the map in something commercial, contact me. If you need it altered somehow, contact me. The last time a wild paddlefish was seen in Ontario was 1917. Paddlefish roe (eggs) make fine caviar, and as is the case with many species of sturgeon, this fact has had a negative impact on the species’ population. Tight rules now govern the harvest and sale of paddlefish roe, but poachers still take fish illegally as there is money to be made. Read the journal of just about any early European explorer traveling up the Mississippi and you’ll find references to the paddlefish. They must have been extremely common before we fished, dammed and poisoned them to their current reduced state. One of the earliest illustrations appeared in the account of Antoine Simon LePage DuPratz (1695-1775), who traveled to North America in 1718 and spent 16 years living in “Louisiana,” a larger area then than now. His memoirs provide a wealth of information about the native people and animals of the region. Here are a few pages on fish and fishing, featuring suckers (what he calls carp are probably suckers of various species, since carp would not arrive here for another century or more; a later author, mentioning DuPratz, identifies the carp as buffalo, which makes perfect sense), gar (“armed fish”), catfish (at least that’s how I would identify his two kinds of “barbel”) and bowfin (“choupic”). If he did nothing beyond this, I’d still consider him a great man: he calls the bowfin beautiful and says many people confuse it with trout for its willingness to take a fly! I don’t know whether the illustrations are based on sketches by DuPratz or wholly created by someone who had never seen any of these animals (which happened a lot, leading to some wildly inaccurate images), but they combine a simplistic style uncommon for animal woodcuts in books of this time with a surprising lack of the fantastic over-imagination also common at the time. “Ecology and biology of paddlefish in North America: historical perspectives, management approaches, and research priorities,” by Cecil A. Jennings & Steven J. Zigler, in Reviews in Fish Biology and Fisheries 10: 167-181 (2000), itself based on a map in Carlson and Bonislawsky (1981), was the source for placement of the dots showing historical, unconfirmed captures. http://dx.doi.org/10.1023/A:1016633604301. The Peterson Field Guide to Freshwater Fishes of North America North of Mexico (Second Edition) by Lawrence M. Page and Brooks M. Burr. HMH, 2011. And the websites of the agencies in each state that govern wildlife, endangered and threatened species, fishing regulations, etc. There are too many to list here. All I’ll say about them is that some states are much better than others when it comes to making it easy to find information. *Making things like this is part of my real job (loving unloved fish is, for me anyway, not a paying gig) as a book designer (mostly the pages, but also covers). I specialize in scholarly and scientific books and journals. If you are a scholar or scientist who needs someone to design your next book or the journals you edit, please get in touch. Tagged endangered species, fishing, map, NANFA, paddlefish, polyodon, polyodon spathula.